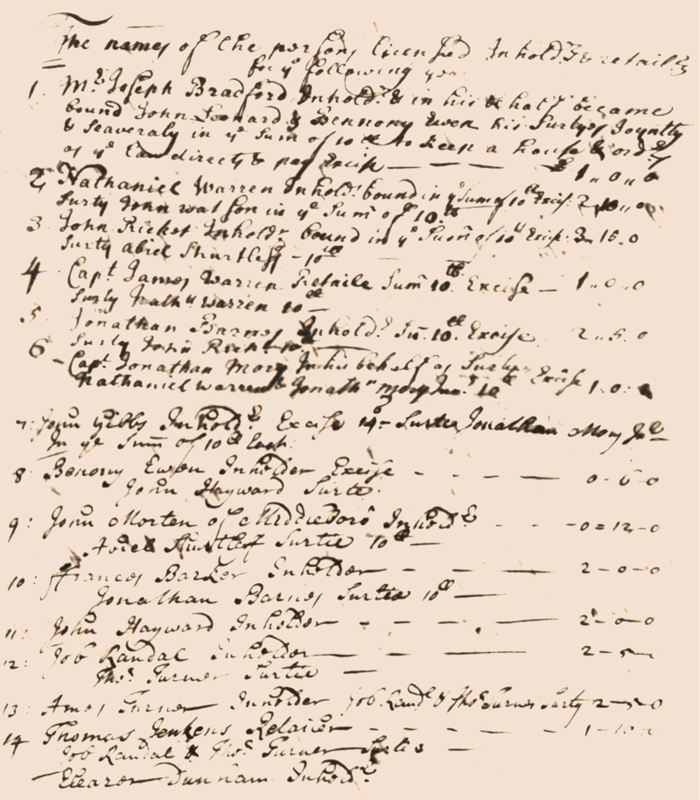 On 24 September 1704, the Plymouth Colony Court of General Sessions granted liquor licenses to several colonists. Each deposited a bond (“surtie”) with the court to ensure orderly behavior of their patrons, except, for some reason, the last man listed. That would be my seventh great-grandfather Eleazer Dunham (1659-1719). He’s listed as an “inholder,” that is, an innkeeper rather than a retailer. So he was in hospitality, not distribution. This was the Eleazer Dunham who was the son of Joseph and Mercy (Morton) Dunham of Plymouth, the husband of Bathsheba Whiston. I am descended from his son Israel (1689-1726). I like to tinker with vintage cocktails, so I have a well-stocked bar. I encourage guests to ask for whatever they like, and usually I can prepare their favorite drink for them. Above the bar is the framed liquor license of my ancestor Eleazer. It was only valid for a year, so it expired 311 years ago. I hope nobody notices that.